Something else was going on in Danville this weekend other than the toxic coal ash debacle. Less than three months after I decided to host a Death Cafe here in town, I’m pleased to report that our first meeting was an overwhelming success. We met at the Danville Museum of Fine Arts and History, the former home of the Sutherlin family, on February 8 from 1:00-3:00 in the afternoon. I was impressed with the turnout: 12 people participated in the discussion and one unregistered person came in at the very end as the cake was being served so I didn’t include him in the official tally. (I’ll have to make sure that everyone knows that you need to come for the discussion, not just the cake next time as well as stress the importance of the RSVP process.) There were eight people who had registered and didn’t attend, but luckily three of them contacted me beforehand so that I could plan accordingly. One individual came to the venue for something museum-related near the start of the event and asked if it was all right for him to participate. Coincidentally, he used to work in the cemetery industry. One of my friends donated graveyard cupcakes. I facilitated one group and my friend, a local college professor and fellow death-awareness advocate, facilitated the other group. Sticking to the official guidelines, topics weren’t assigned but I did provide a list of “conversation starters” and death-related quotes which came in handy a few times. I think once everyone started to feel more comfortable with “new” people they began to open up more and the ideas started flowing more freely. Some of the topics were: the importance of voicing what you want done with your corpse, the afterlife, emotional and spiritual readiness for death, planning your own funeral (I made it known that I wanted a secular funeral service and a headstone reminiscent of the late 19th century), Victorian mourning traditions, fears concerning dying, society’s attitudes about death, death in other cultures (ex. Tibetan sky burials), and how being aware of mortality impacts one’s daily life. I was extremely lucky that things came together as smoothly as they did for this cafe and that we were able to offer it entirely free for participants instead of having to ask for a suggested donation. In the future that will most likely change since we all know that teachers aren’t independently wealthy and this is a non-profit venture. I reached out through email, Facebook, and snail mail to at least three dozen local businesses, health care facilities, and area hospices to invite them and let them know how valuable this type of discussion is for the community. I also sent sponsorship information with those invitations. One of the local funeral directors suggested that we could hold a future event at one of their facilities, which I thought was a great idea. Hopefully as time goes on we’ll receive more support from the community. Things like this take time to get used to, especially in this area. As far as “buy your own food” venues, Danville doesn’t have much in the way of coffee shops that are open on weekends or afternoons, unfortunately. A potluck type of event is also something to keep in mind to keep costs down. One of my friends graciously donated cupcakes and my boyfriend provided the bottled water and he and my co-facilitator helped with the planning and set-up. I made skull-shaped sugar cubes, took care of the publicity and organization, and contributed the tea. Jessyca of Jessyca Reynolds Custom Cakes (whom I’ve known since my angsty, heavy metal teenage years) was kind enough to provide the gorgeous skull cake shown above. 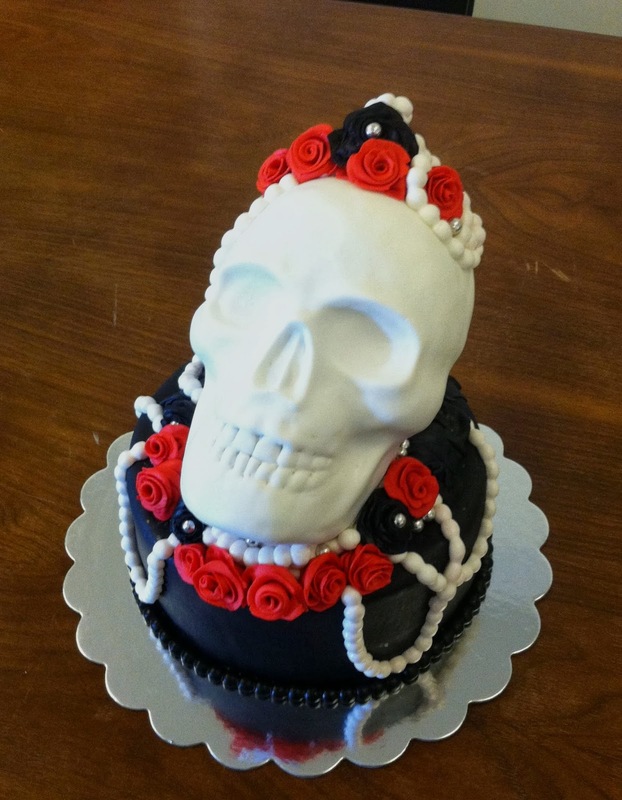 (The skull was red velvet inside and the base was vanilla. It almost hurt to slice it!) Of course the dishes, silverware, coffee urn, and floral decorations were courtesy of the venue. If you’re interested in attending future events, please visit the Facebook page for updates.